What are the 5 super tips for Amsterdam sightseeing? Sightseeing Amsterdam’s city centre is a unique experience and our channels are world famous. Downtown Amsterdam unites history and architecture to an extend that makes it worthwhile to spend a day or two just walking our city centre enjoying its sightseeing highlights. Most of them are within a minutes walk from the Hostel Downtown Amsterdam or the cheaper Guesthouse. In this article the best ‘must see’ completely free highlights. Did you also checkout out our articles about Amsterdam’s best budget restaurants and the Amsterdam Festivals? Amsterdam’s sightseeing highlights contain a boat-trip through the historic 17th-century channels, inspiring architecture, state-of-the-Art-museums and a visit to our famous red light district. The seventeenth-century canals of Amsterdam together, form a neighborhood and so, the center of Amsterdam. They were added to the Unesco World Heritage List in August 2010 and is an international icon of urban planning and architecture that is still intact after four centuries. It is know for its environment of 17th century canal homes with small bridges over the canals. The Amstelpark is a park in Amsterdam-Zuid. The park includes a labyrinth, a café, a restaurant, two galleries, an orangery, petting zoo and a mini-golf course. And of course the various catering facilities are not lacking. Fries at the snack bar’s Bastion, a traditional scoop ice cream at the IJstuin, pancakes at The Minigolf, delicious pastries at Park Beach summer to delicious culinary delights at the restaurant Rosarium. Also culinary enthusiasts each month visit the park for Pure Market, an organic and artisan market. Something for everyone! Amstel Park is a perfect combination between beautiful nature, fun activities for kids, beautiful locations on the water to enjoy a drink and a snack and admire the creative arts. The Vondelpark is Amsterdam’s most popular park, attracting tourists, residents, and everyone in between. The park is home to a selection of restaurants and cafés, including the Blauwe Theehuis, Café Vertigo, and Groot Melkhuis. You’ll also find a skate rental shop, an open-air theatre and a rose garden with more than 70 types of roses in the park. The Vondelpark was designed by landscape architect L.D. Zocher and has been awarded national heritage status. It is often claimed that the house located at Singel 7 is the narrowest in the world. While there is some truth in this, it’s actually the house with the world’s narrowest façade – this is the back of the house, the front of the house is much wider. You’ll find Amsterdam’s smallest house (and the property with the narrowest front façade) at Oude Hoogstraat 22. The house is 2.02 metres wide and 5 metres deep. The Amsterdam was an 18th-century VOC (Dutch East India Company) vessel which was used as a cargo ship. The Amsterdam has been moored next the National Maritime Museum since 1991. This boat is actually a replica – the original was wrecked during a violent storm on its way to the Far East in 1749. 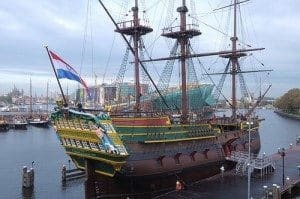 Besides viewing, you can also visit the Amsterdam with a ticket of the National Maritime Museum.